This shop is owned and managed by CETOX Limited. Our main aim is to make sure our customers are completely satisfied. If you have any suggestions or comments please email us using the link on the shop page or call our sales team on 07811 606 606. We are a limited company and our head office address is: CETOX Limited, The Cavendish Centre, Winnall Close, Winchester, Hampshire, SO23 0LB. our company phone number is 07811 606 606. we are registered with companies house, and our Company Registration Number is 9138720. Purchasing good from this online shop could not be easier. Just find the product you want. Add it to your shopping cart. Proceed to check out, and fill in your details. We need your details so as we can send you the items you have ordered. We never disclose your details to any third party. All orders are sent out in discreet packages. In either envelops or boxes. All orders are sent out the same day providing the order us with us by 3.00pm. We only use Royal Mail, and every item is sent 1st class, so you should reciece your order the following day. 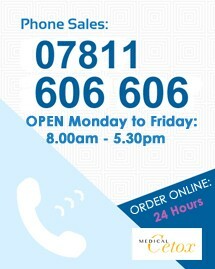 If you have not received your order after 7 days, call us immediately on Telephone 07811 606 606. With all orders,mp,ease make sure you use a valid address, and email address,many phone number. These details are vital if we are going to send you goods, an invoice etc. Your credit or debit card payments are encrypted. We never see your credit or debit card details for any order done through our shop. Payments over the phone are entered into our credit card machine, and are never stored by us. Guarantee All our items come with a 30 day money back guarantee. if you have not received your item within 7 working days, we will refund you in full.